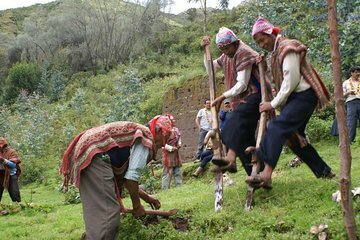 Explore the rich traditions and daily lifestyle of Peru’s indigenous Amaru community during this flexible trip from Cusco. Discover the daily activities of the group, as you take a hands-on session on weaving and learn about farming, use of medicinal plants and reforestation from local community members. You’ll also get to enjoy snacks and a delicious traditional lunch prepared from fresh, organic ingredients. Your Amaru excursion also includes a professional guide, local community guide, all activities and round-trip hotel transport.